There are certain jobs that are a bit scary, and anything to do with making major, complex cuts in the fuselage is one of those scary jobs! In this case I needed to make two big, scary cuts - one for the left door and one for the right door. The procedure is pretty straight forward but still, there’s really no room for major error here. In the end, both cuts came out pretty darn close, but comparing my template marks to the pre-marked areas for the door I found that they didn’t match too closely. Still, it was successful! 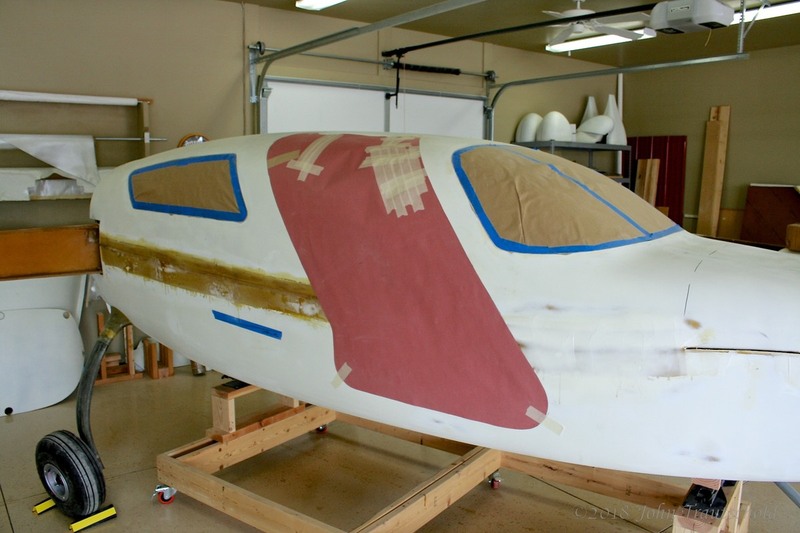 The first step is to create a template for each door that is used to transfer the dimensions to the fuselage. I ended up purchasing some stiff rosin paper from Home Depot and used rubber cement to hold it to the door. Of course, the door has some compound curves and such, and stiff paper doesn’t like to bend around those curves, so I had to cut slices in the paper at certain spots to get it to fit tightly. I had to make an accurate template for each door before cutting into the fuselage. 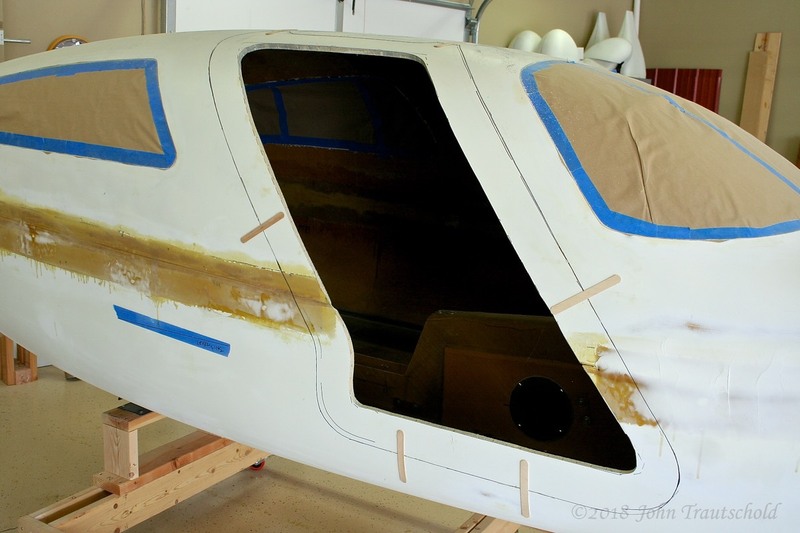 Here’s the co-pilot side door template before final trimming. You can see how crinkly it is in that one area due to the curves. Once it’s on the side of the fuselage it does smooth out. You can also see where I made some cuts to get the paper to flow across those curves. Here's the right side template before final trimming. The template is now in place. 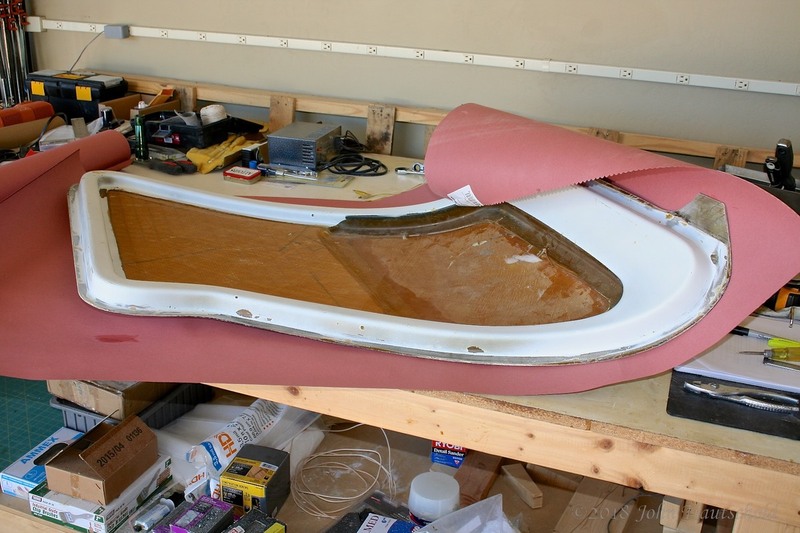 The curved areas on the upper part of the template were tricky. I messed around for quite a long time making sure I was getting it right. Naturally I had to do the same thing for the pilot-side door. In addition to making the template, positioning it is also tricky. The factory does mark a location for the door cut, but they admit, as does the manual, that it’s not all that accurate. The only area that’s guaranteed to be accurate are the door hinge latch locations on the top and the curved area on the left. But even there, the manual states that it’s more critical that the distance from the windshield edge to the side of the door be consistent along that entire area - AND that both the pilot and co-pilot sides match as closely as possible. So even with the guaranteed factory markings, there’s still some fudging that needs to be done. 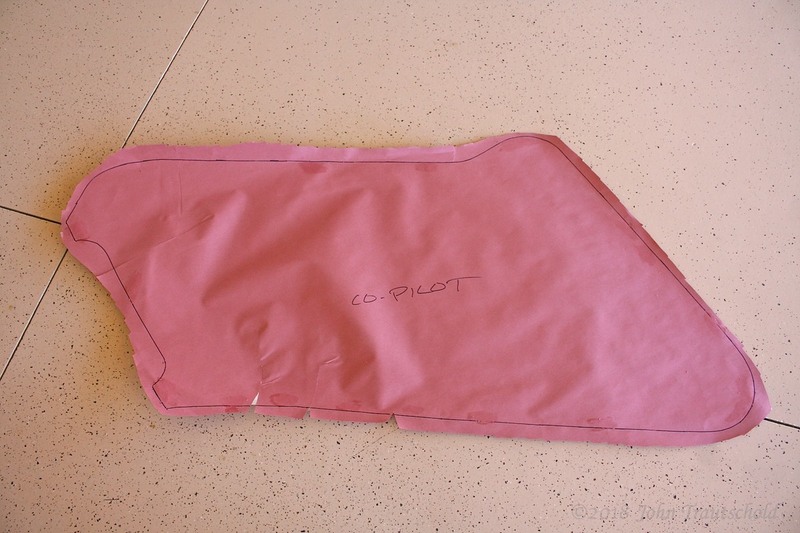 Here the co-pilot side template is in place, ready to mark the fuselage for the cut! 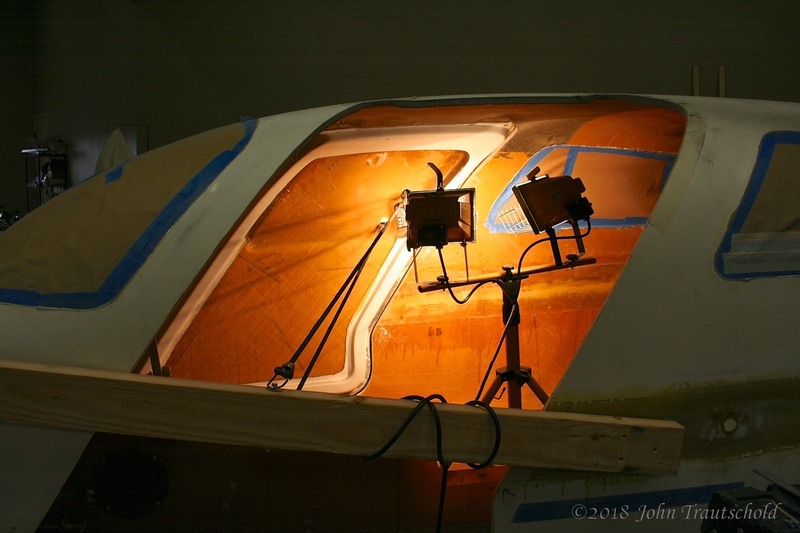 The middle of the door cutout area was previously cut for access to the inside of the fuselage for the internal lay-ups needed to “weld” the top and bottom fuselage halves together. See Section 5.2.0 for that process. In any case, in the photo below, the actual door template markings can be seen. In this case the door has already been cut out. 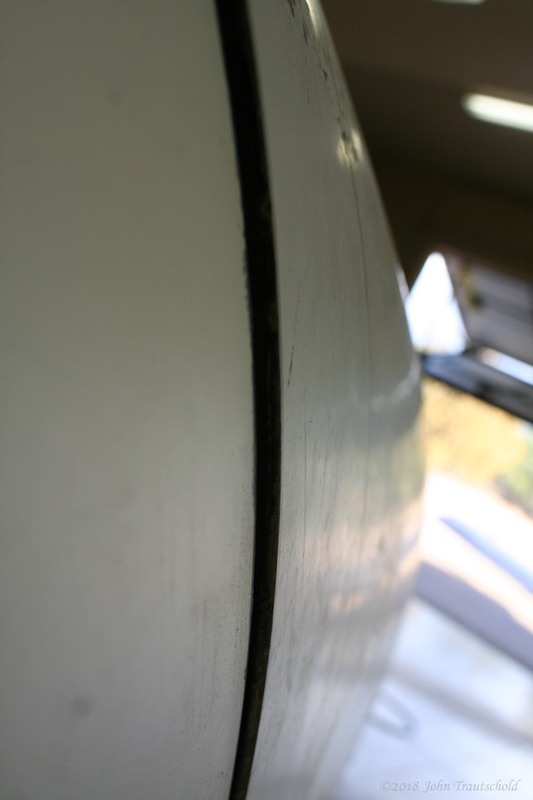 If you look towards the bottom of the door you can see some curved markings made by the factory. You can see how far off they are compared to the actual door opening. 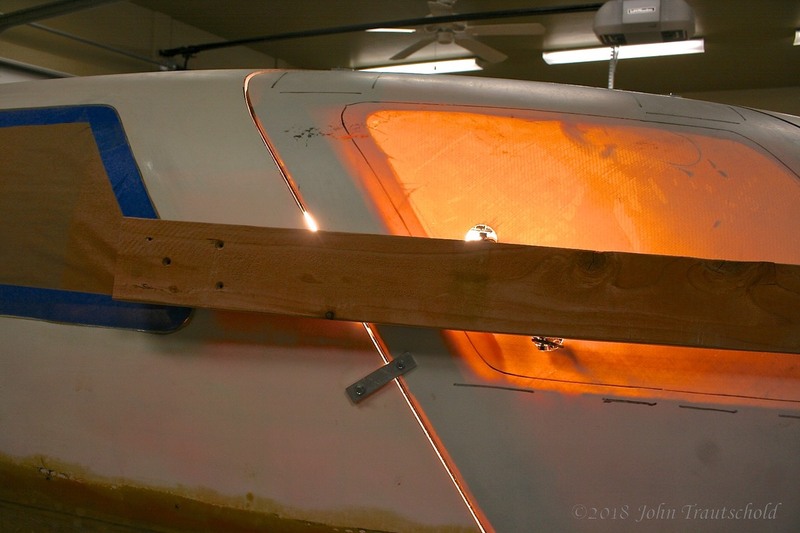 The left side shows the raw fiberglass lay-up while the right side shows my initial preliminary finish coat to smooth out the lay-up. You can see in the photo below how far off the door is to the fuselage. Other builders had to deal with this as well and they decided to use heat to try to reform the door to the fuselage. I tried the same thing. See below. Hmmm, a little bit of a gap. That's not good! That’s 1000 watts of light creating heat to try to soften the door so that it reforms into place. I’m using a couple of bungee cords to apply pressure to help close the gap. I left the heat on here for a couple of hours. The bungees are attached to a couple of 2x4s on each side. Using a bit of heat to help reshape the door so that it fits better! Here’s a view from the door side. The bungees are pulling on the 2x4 which is placing pressure against the door to help reshape it into place. This first attempt was somewhat successful. It closed the gap down by about half. Once the actual door frame flange is in place and the door is on its hinges I’ll do this again to try to pull the door in nice and tight. I’ll be doing the same thing to the pilot-side door but the problem with that door is at the bottom so I probably won’t be able to use the bungee method there. We’ll see. Using a 2x4 and some bungee cords to help pull the door into shape with the application of 1000 watts of heat. I had to make sure that I didn’t apply too much heat. I don’t want to melt any of the insides of the fuselage! The next step is to create the door flange that I mentioned above. That process starts in the next section.